Whenever a professional conference looms in my future as a certainty, generally three or four months ahead of time, depending on where the conference is it always feels either a bit like waiting for the Oscar nominees to be announced or waiting for the name of who is next to be cut from a dance competition. Certainly there is an element of utter predictability at these things: copious amounts of free pens, for example, or uncomfortable sales pitches by vendors you likely have neither money nor power to patronize, or a seemingly endless array of open bars in various hotel conference rooms, necessitating awkward mornings after. But still, new city, new people and a break from the air conditioned nightmare...yes, please. After being given the okay and a few days spent calculating the endless permutations of air travel and hotel booking, I was off to Seattle for five days. Generally I am alone on flights for these work trips. I am usually very comfortable doing things alone but nowhere do I feel more comfortable being solo than in an airport. There is so much people watching to do, so many glossy magazines to buy, so many packets of mixed nuts to get "for the plane ride" that you'll actually consume before boarding. This time, however, my coworker Mike was on the same flight. There was only one other instance where I have seen Mike outside the confines of work, when we randomly ran into one another at the movies. I got the same sensation that time as I did seeing him at the airport which was really just my brain's way of adjusting to seeing someone outside of the element where I have them firmly placed. That strangeness quickly went away since Mike's a cool guy and in the pantheon of coworkers I could have ended up travelling alongside, I'm glad it was him. It was also nice to have company while I performed my preflight ritual of buzzing my brain to assuage the existential panic I usually feel while taking off and landing. There was little to nothing notable about my flight other than I could not sleep and my row mates were getting a buzz going. I'm always surprised when people buy both food and alcohol on the flight, considering all of it is overpriced and crappy. But I suppose for a 6.5 hour flight, people think it is worth it. And after we landed at around 9pm Seattle time (12am NY time) and were ravenously hungry, I found myself thinking back with longing to that overpriced cheese plate I could have had for the low low price of $11. I'm glad we decided to take a taxi to downtown because our driver was pretty hilarious. In one long breath he told us about how liberal Seattle is, how weed is about to be legalized, how one specific neighborhood was where "everything" was (when asked to clarify he said "gays, lesbians, dykes...everything"), and how the bum sitting on a particular street corner was working for the NSA. That last point was the diving board for a rant about how the government is watching everything you do. I liked him. He was also the first person in the city to point out the Space Needle. I always remember the person who plays the human compass for me in a new city. So thanks, hippie taxi driver. I don't know why or where I got the idea that Seattle would be like a mini-Brooklyn but I was mostly wrong. In fact, a lot of the locals I met and saw reminded me more of where I went to college which was in the neo-hippie 90s in a tiny upstate New York town. And that whole atmosphere would be appropriated by today's hipsters so maybe Seattle was more like this year's version of a redoing of 90s neo-hippies? Ok, I just gave myself a headache. unrelenting friendliness of the locals. My first day there I walked from my hotel to the Space Needle (everything is so beautifully walkable there) and no less than three people said hello and smiled. At first, I did that "looking behind me to see who they were really talking to" thing which made the friendly guy laugh. Then I just got used to being pelted on all sides with soft blows of friendliness from strangers. Places like Seattle remind me that New York is coated in a hard candy shell. Sometimes I like to see the soft sugar underneath. Even the homeless, of which there were many, were friendly and polite. It seemed to me a city populated with the kind of people who would be in a clean, tasteful bar on a Monday afternoon. If you know me at all, you know that I love that. I took a walking, coffee tour of the city. This was probably the best tour I've ever taken in any city. I don't say this strictly because I was infused with liquid crack after 2 hours, but rather, because the tour guide was so knowledgeable not just about the unofficial official drink of the city but about the history of the neighborhoods we walked through and the unabashed love he had for his hometown was pretty evident from the beginning. I met a nice Swede on vacation and we had a great conversation about where he was from and where he was heading, which reminded me of why I love to travel so much. The sheer opportunity of meeting people from the other side of the world is something I don't ever want to stop doing. On that tour we were also taken to this place which had these amazing truffles, my favorite being a coriander and honey flavored. It was given to us with cold brewed coffee and I was again reminded of the chemistry of flavors. I'm glad I found that website because I need to order some as soon as I'm done with this blog post. I took another tour called the Seattle underground tour. That was particularly interesting because it seemed like the founders of Seattle were pretty dumb. And I mean that completely respectfully but honestly, they didn't even take the tides into consideration while building their town. And there was a convoluted series of ladders and broken walkways and everything flooded in sewage for decades. It seemed like Seattle was the worst place on earth to live; the 19th century's Florida, if you will. What was also interesting is that this tour was essentially a walk through a series of musty, unfinished basements with scattered artifacts everywhere. I did panic for about two minutes at one point, imagining the whole thing collapsing but that was only because the tour guide had spent several minutes telling us how the whole town flooded and burned and collapsed during its brief history. I ate some really good Vietnamese food and one pretty good crumpet. Other than that, I didn't really find the time or gumption to eat any fancy meals. The conference had plenty of free food on offer but, as Mike and I later discussed, we got used to feeling hungry. It was a little bizarre since I usually bee line to the food. This trip, it was straight for the alcohol. Even at dinner, I was drinking which I rarely do. Ahem. As I stated before, these conferences usually have an element of boozy fun involved. I think I probably drank every night. Saturday night, following a tip from a local, Mike and I went to the Capitol Hill neighborhood to soak up some local flavor (and local beer) and what little I remember of that night was fun. I remember The Pine Box, which we learned from a local barfly was a converted mortuary. I wish the website had photos of the bar because I'd like to remember what it looked like. I do remember they played Pearl Jam and Nirvana and thinking "I guess I actually am in Seattle now." I know we went to at least two other places; I have a scrawled note on a post it with the name of a song that I have a vague memory of the bartender writing for me. Then there was some crazy dancing. And I talked to a guy from Vancouver who knew NYC pretty well. If I ever go back to Seattle, I'm heading straight for Capitol Hill. I had such a great time, that I wanted to physically crawl inside a hole the next day. Proof positive! I did some conference crap and marginally met some people from all over the country. I remember sitting next to a woman who was breathing so heavily and had some serious lag time in between those heavy breaths that I was completely distracted by the sound for the entire session, pretty much out of fear that she would stop breathing altogether. It reminded me of my ex boyfriend who had sleep apnea that terrified me. I don't think breathing should be cliffhanger. This being a professional conference, I was powerless to do anything but keep looking over at her to make sure she was going to breathe again. I attended a social gathering that catered to Gen X and Gen Y conference goers; it was in fact called GenX/GenY Social and had a specialty menu of cocktails (I had two GenX's, represent) and met a slew of people, one very interesting guy who had me at "What are your top five Woody Allen movies?" There was a good band playing the event and when it was over (the jury is still out on what constitutes GenX and/or Gen Y), I walked home, into that pristine night air and felt immersed in the city. I want at least one night per trip where I can wander, aimless the streets of a new city. Well, I had an aim this time so, ok, a guided aimlessness. That's perfect, actually. I wish to wander this life with a guided aimlessness. There you go. After walking through the building and trying unsuccessfully to not get lost at least once, I made it to the uppermost floor that was open to the public where they had an atrium. However, it was overcrowded and I was unable to get a picture. 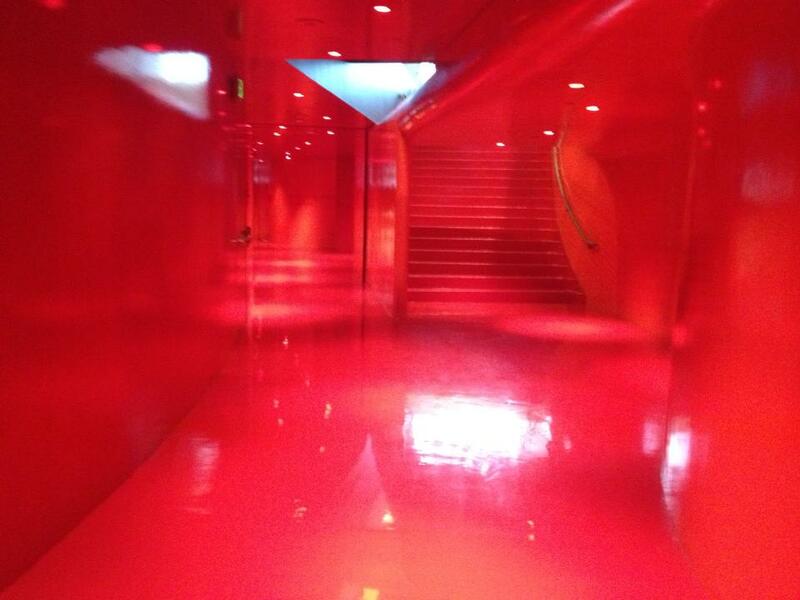 Nevermind that though because for me, the highlight of the building is that red floor. It felt like I was in a David Lynch film. From the library I took a quick walk to Pike Place Market. I saw flying fish. I ate a crumpet, had what was probably my 20th cup of coffee in 4 days. I used some pretty immaculate public bathrooms. I bought some souvenirs. An old Chinese woman asked me where I was from and when I said New York she said "I knew it. That's why you are so pretty. Women from New York, Chicago and Los Angeles are always pretty. Women from places like Nebraska and Texas are always...tired." Those were her words! I think she was trying to get me to buy more. It was my last day for conference stuff so I did my duty and went to some programs. Since I had started my day early, I still had at least two hours until my next meeting so I decided to do as the Seattlelites were doing and I went to have a martini in my hotel bar. Unbeknownst to me when I booked the hotel, this place had the best martinis in Seattle, according the guidebooks and a few locals I spoke to. I looked at my watch and saw 3pm and after deciding it was acceptable martini time, I ordered one and can't honestly say I will ever regret it. It was damn near perfect, just like that afternoon with me sitting in an old world bar, day drinking and ruminating over the last few days. There was a young guy sitting at the end of the bar talking about how it should be sad hour, not happy hour. He was too young to be so melancholy, then again, he was an anachronism; so young, sitting in an old fashioned bar, drinking an old fashioned drink. I could tell after a bit that he started to feel better because he got flirty. Still, everything about him was so very Seattle, or what little I could glean from four sober days and one very drunken night in the city. That evening was the last big party thrown by one of the three major publishers in my field. They always have a huge party at the end of these conferences. There was a live 80s band and it was thrown in a big room inside this museum. It was all very festive, but it felt a little rushed. I think maybe I was just tired from the nonstop exhilaration of gallons of coffee and booze. Inside the museum, I walked around the Nirvana exhibit, despite sensing it would make me melancholy (it did) but worth it anyway (it was). The museum is at the foot of the Space Needle and when the party was over, Mike and I decided to ascend. 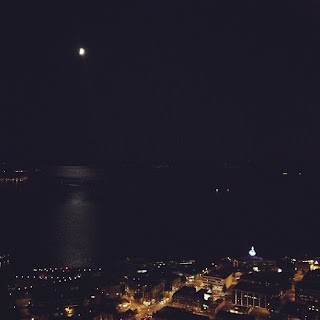 I wanted to see the view at night. It seemed like the city was draped in black silk. The air was so pure and calm that it made me wish I hadn't spent the evening pickling my liver. 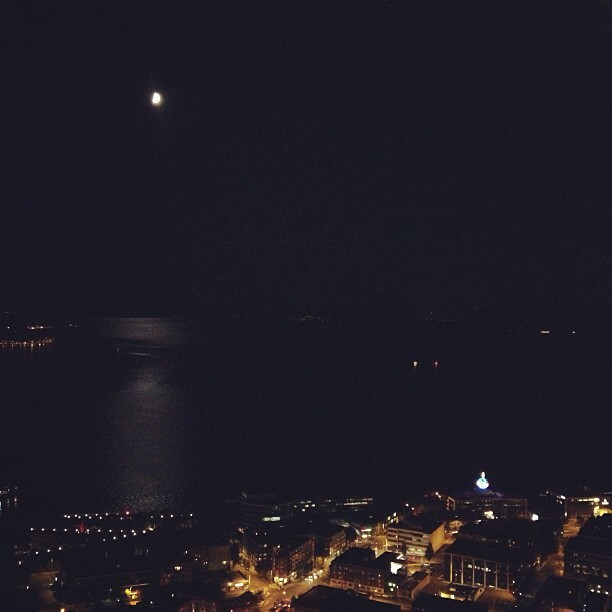 Still, I'm so grateful I got to see that view change so dramatically from day to night. It was worth it. I left the next morning and got on a flight with another coworker and we spent the better part of a seven hour trip home, getting to know each other. It is bizarre to find out how much you have in common with people you work with when you talk to them outside of windowless rooms. Before I knew it, I was back home, back to life, back to wishing I was still away. O the humanity. 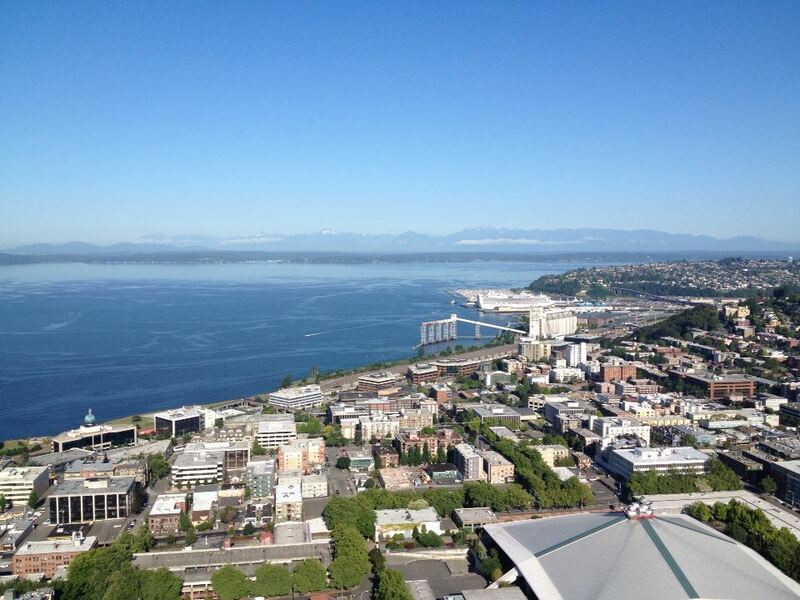 Seattle is a beautiful city with beautiful people (no matter what that tourist shop lady says). I wish I had gotten to try more seafood and less beer. Who the hell am I kidding? I loved it all. I met a lot of people who were road tripping the Pacific Northwest and it feels like a trip that beckons. I really just think we should all get a van together and go.